Google is helping people experience a white Christmas and giving them a light show for Hanukkah -- all on their computer screens. The tricks, called "Easter Eggs," add to a long lineup of similar antics to amuse people using Google sites and products. 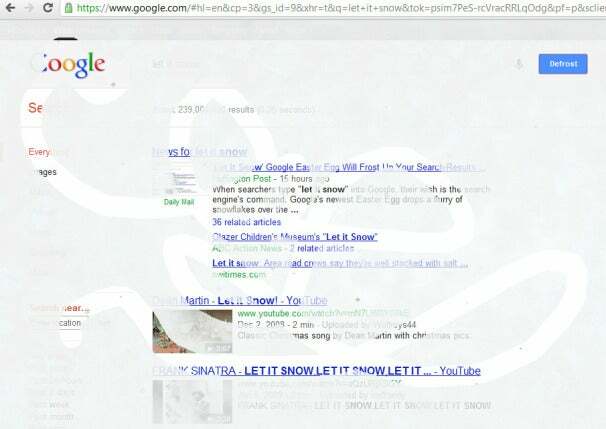 To get some of your own virtual snow, just use Chrome or Firefox on your desktop to go to Google.com and type in "let it snow" without the quotation marks. First, you'll see snowflakes falling from the top of your screen. Next, it will appear to frost over. You can either hit a "Defrost" button to better see the snow falling, or click and hold your mouse while drawing on your frosted screen just like a kid drawing on a window with a finger. If Hanukkah is your thing, Google's got some love especially for you. Enter "Hanukkah" (again, without quotes) at Google's main page and you'll see a string of yellow lights across the top of your screen. Lucky individuals now walking around with Ice Cream Sandwich on their phones, for example, can open an Easter egg there, too. To see that one, go to Settings, About Phone and tap the Android version several times in a row. A little Android will appear. Long-press on the Android and he’ll get bigger and turn into many little Androids that zoom across the screen. And just last month, PCWorld tipped readers to a wacky Easter Egg that actually makes your Google Search results page do a barrel roll. Try it yourself, it still works! There's much more fun where this came from. Check out PCWorld's Best of Google 2011: Gags, Easter Eggs, Pranks, and Games.